Delivery to foreign unknown customers only against payment in advance. Postage will be charged according to the rate of postage charged by the Swedish Post. Unfortunately all information regarding the stamps, cancellations etc. is in Swedish. 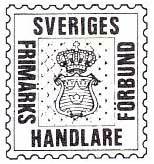 The stamps are catalogised according to the Swedish catalogue Facit for the Nordic countries and according to the German catalogue Michel for stamps outside the Nordic countries. Please note that blocs come after the regular numbers. or or after contact with us in banknotes. When paid to our IBAN all bankcosts are to be taken by the buyer. Please, note that postage can be lower or higher than what is shown on the invoice you receive directly after your checking out. The postage shown on the invoice is for letters with a weight up to 100 gramme.